Friday, September 21, 2018 On September 21, 2018, the 640 Heritage Preservation Foundation co-sponsored the fifth Alice Ross Carey Memorial Lecture with San Francisco Heritage. 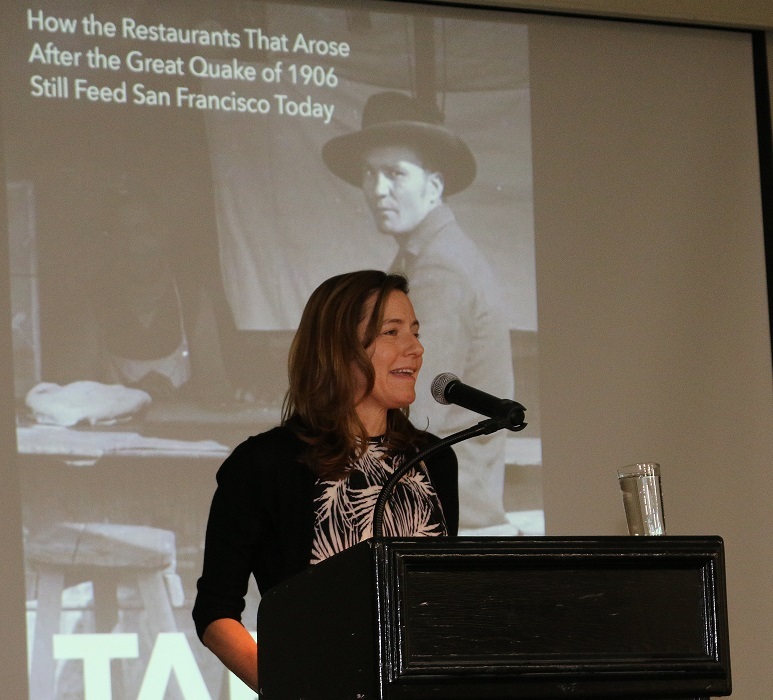 It featured author Denise Clifton discussing this rich culinary and cultural history and her book, Tables from the Rubble: How the Restaurants That Arose After the Great Quake of 1906 Still Feed San Francisco Today. Wine, Women & Financial Wisdom is a financial seminar for women by women about the important documents that you should have. 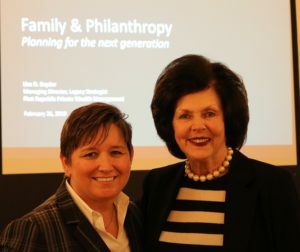 This in-depth discussion on the Advance Medical Directive for Health Care from a financial and medical point of view presented by Lisa Hutar, Managing Director, Senior Financial Planner, First Republic Bank and Sara C. Stephens, RN and Founder, Sara C. Stephens Medical Advocacy & Planning. At Ruins to Redemption: Historic Preservation Committee Fund, we learned how a small band of preservationists held the City and a developer accountable creating the $2.5 million Historic Preservation Fund and Committee in 2005. The grants awarded since have helped protect thousands of historic buildings. Planning Commission President Rich Hillis and a panel including Charles Chase, Shayne Watson, Randy Shaw, Barbara Ockel, and Woody LaBounty examined the origins, legacy, and future of the Historic Preservation Fund Committee. The 640 Heritage Preservation Foundation presented held at Shop for a Cause event at St. John Boutique San Francisco on September 21, 2017. There was informal modeling of St. John’s latest arrivals, champagne, and hors d’oeuvres Thursday evening with 10% of all regular-priced purchases being donated to the 640 Heritage Preservation Foundation. Renowned Architectural Historian Michael R. Corbett has been selected as the 2016 Alice Ross Carey Lecturer by co-sponsors San Francisco Heritage and the 640 Heritage Preservation Foundation. Mr. Corbett, who prepared the Metropolitan Club’s 2004 National Register nomination, had since that time, hoped to delve more fully into the lives and body of work of the Club’s architects Bliss and Faville, a project never before undertaken. With a grant from the 640 Foundation, his extensive research is essentially complete and a manuscript underway. His lecture will share aspects of his findings as a way of looking at the architectural profession in that formative period in the City’s development. 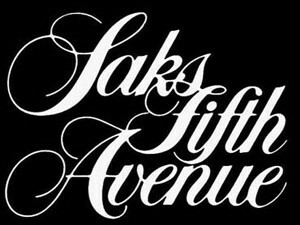 Saks Fifth Avenue and the 640 Heritage Preservation Foundation presented a fashion show of the St. John Spring 2016 Collection. Ten percent of sales, up to $5,000, went to benefit the 640 Foundation. We are grateful to Saks Fifth Avenue, the Nob Hill Gazette and Lois Lehrman, California Caviar, Paula Bennett and Grail, the Crimson Wine Group and the Leading Wineries of Napa for helping to make this event a success! The Metropolitan Club is near and dear to our hearts and has played a significant role in our lives as women leaders as well as in San Francisco’s history. With your support, our next 100 years had a memorable beginning. 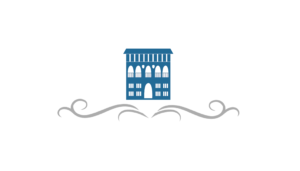 The Centennial Gala was a benefit for the 640 Heritage Preservation Foundation. With enthusiastic and generous member support of the Centennial Gala, the Foundation will be able to grant $300,000 to the Club this year. In July 2013, the City of San Francisco lost an important preservation advocate; the 640 Heritage Preservation Foundation lost one of its three founding members and immediate past president, and the Metropolitan Club lost a Member who played a critical role in its seismic and life-safety renovations. 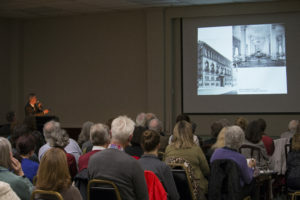 This year’s lecture featured speaker, Erin Garcia, curator of the California Historical Society’s current exhibition, “City Rising: San Francisco and the 1915 World’s Fair,” speaking about women at the 1915 Pan Pacific International Exposition in San Francisco. In her talk, Ms. Garcia will profile five notable women including Phoebe Apperson Hearst, the well-known philanthropist who served as honorary president of the Exposition’s Woman’s Board; Delilah Beasley, the African-American reporter who covered the fair for the Oakland Sunshine newspaper; and Alice Sue Fun, a 16-year-old department store stock girl who described her visit to the Exposition’s Chinese pavilion as “the highlight of [her] life.” Their stories represent their distinctly different positions in society and help us understand the diversity of female experiences in 1915 San Francisco. 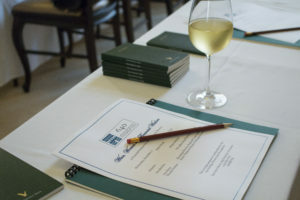 This special event was co-sponsored by SF Heritage. Saks Fifth Avenue and the 640 Heritage Preservation Foundation presented an exclusive show of the Armani Collezioni Fall 2015 Collection. Ten percent of sales, up to $5,000, went to benefit the 640 Foundation. In July 2013, the City of San Francisco lost an important preservation advocate; the 640 Heritage Preservation Foundation lost one of its three founding members and immediate past president, and the Metropolitan Club lost a Member who played a critical role in its seismic and life-safety renovations. 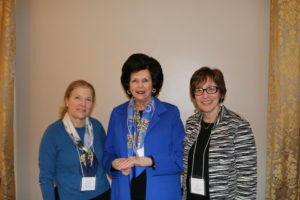 Thank you for attending the sold-out lecture honoring the memory of Alice Ross Carey, Featuring speaker Anthea M. Hartig, Ph.D., Club Member & Executive Director of the California Historical Society. 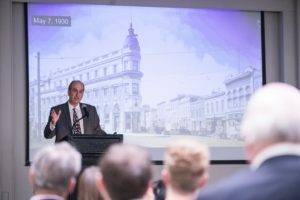 Dr. Hartig discussed the legacy of pioneering preservation architect Alice Ross Carey, including projects such as the Palace of Fine Arts, Metropolitan Club, San Francisco City Hall, and the State Capitol. This special event was co-sponsored by SF Heritage. More information on this event can be found here. Thank you to our many event sponsors.